The Grand Canal, completed in 1811, was originally an import connection between the city of Dublin and the river Shannon. Cycling the Grand Canal is one of my favorites. The cycle paths along the canal guides you safely and easy from urban life to the rural areas outside Dublin. 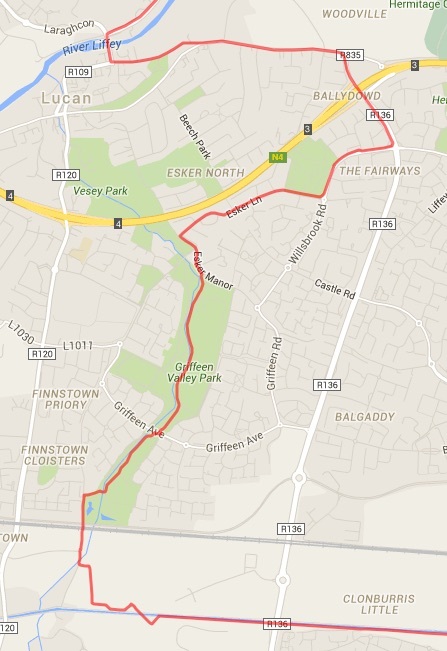 I passed Lucan when I was biking another route and decided to make a round trip that included both the Grand Canal, the village Lucan and the Phoenix Park. The Grand Canal Dock is an excellent place to start a bike trip in Dublin. The GPS tracks start by the Grand Canal Quay and follow the canal south to Ballymakaily (shortly after Grange Castle). From here you turn to Adamstown, crossing the railway and N4 and then follow the R120 where there are cycle tracks almost all the way to Lucan. Lucan is – according to Wikipedia, a suburban town in South Dublin, Ireland. It is located 13 km from Dublin city centre and is situated on the River Liffey and River Griffeen. 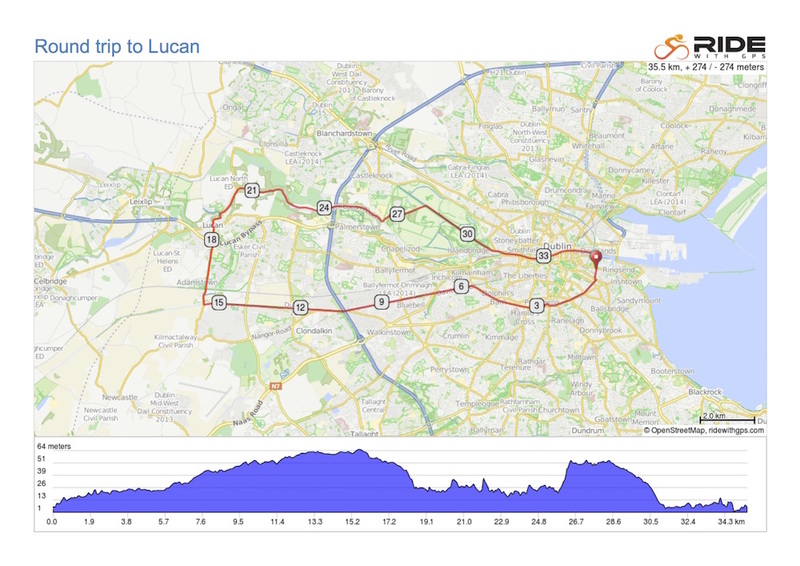 From the start of this tour, it is approximately a 18 km ride, maybe Lucan should be a pit-stop? On the positive side you will end up at Wright Anglers Rest where the best fish & chips I’ve ever tasted is served. You may follow R109 directly to Dublin but I will recommend to ride through Phoenix Park. You will enter the park following Knockmaroon Road. The ride through Phoenix Park continues on Furze Rd to Chesterfield Ave where you turn right. You should follow the avenue back to R109 and the River Liffey. 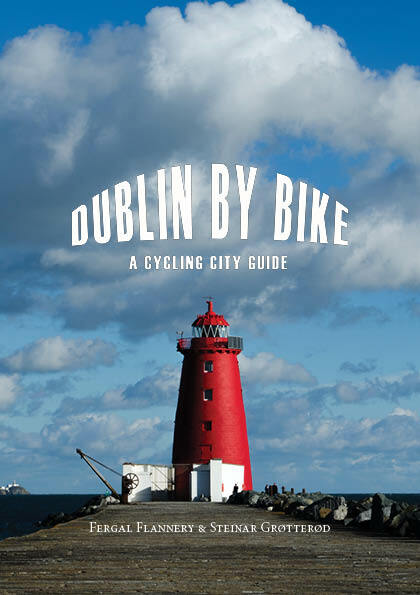 From here you will have to focus on the traffic even though there are dedicated bicycle lanes along the River Liffey. Take care and don’t “fight” with the buses or taxis! Cross the River Liffey at the Samuel Beckett Bridge – a landmark you cannot miss. Then turn left and ride along Sir John Rogerson’s Quay to Forbess Street and you’re back where you started. Stop and read the info-boards along the Grand Canal. A Guinness at the Anglers Rest is a “must do”. The Grand Canal near the Grand Canal Dock. The Green Route, an 8.5km pedestrian and cycle route along the Grand Canal. The Green Route, stretching from the 3rdLock, Inchicore to the 12th Lock, Lucan is mainly an off road, secure and safe alternative for commuters and leisure users. 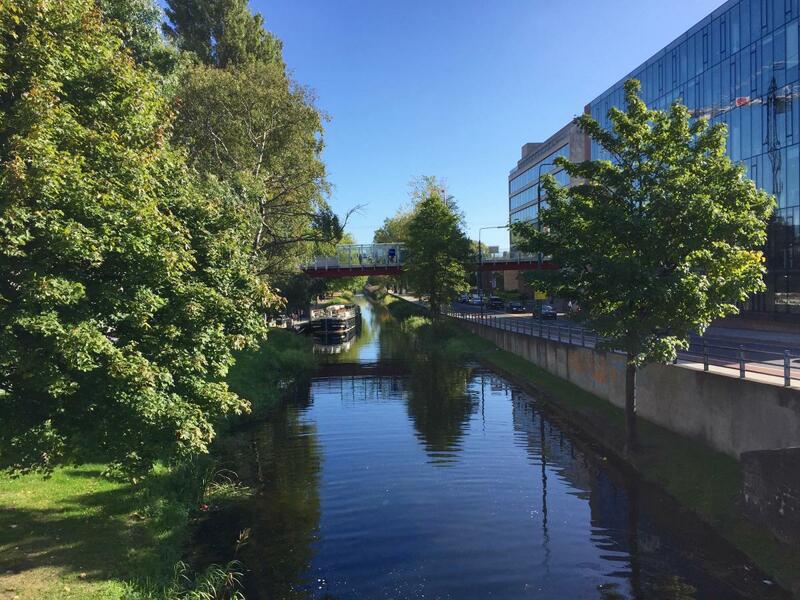 The Green Route project was carried out using an inter-agency approach between ESB Networks, South Dublin County Council, Dublin City Council, and Waterways Ireland. This is an alternative way to Lucan. You can enter the Green Route crossing the Grand Canal on the red bridge located before you reach Ballymakaily/Grange (R120). The red bridge is impossible to miss. Taking this route you will pass Griffeen Valley Park. The park is one of the most important parks in the South Dublin County Council administrative area. Its existence is largely due to the vision of the elected members and officials of Dublin County Council who had the foresight to conserve the River Griffeen by assembling parcels of land on both sides of its banks and developing them as parkland for active and passive recreational purposes. This work has been greatly appreciated by the public who continuously express their support through their use of the park. Read more about Griffeen Valley Park here. This route can be very nicely extended and largely off road. Continue along the canal for two more bridges. From 12th lock to Hazelhatch is not surfaced, but passable when dry on skinnies, and anytime on mountain bike. Lovely rural stretch. Nice pub at Hazelhatch with seats by the canal. Alt is to go around by road via Peamount Hospital. Next stage is surfaced (part of Arthur Guinnses way) to Alymer bridge. Lyons estate with coffee shop up ahead- worth a detour. Turn right and into Celbridge. In Celbridge enter the main gate of Castletown House and cycle through the estate, exiting by the back (Batty Langley) gate. Magnificent house open to public and a lovely coffee shop in the old kitchens. From back gate cycle past HP, over the motorway and into Leixlip village. From east end of village St Catherines Park (entry by fire station) offers a lovely cycle track by the Liffey to Lucan, where you can rejoin the route and follow the Strawberry Beds back to the Phoenix Park.